Many organizations face access management chaos. As applications and resources have spread across on-premise datacenters and multiple cloud providers, users are often accessing these resources from anywhere and on multiple devices. These simultaneous trends have left access management systems fragmented and access polices inconsistent, resulting in an environment that is expensive to maintain and challenging to secure. 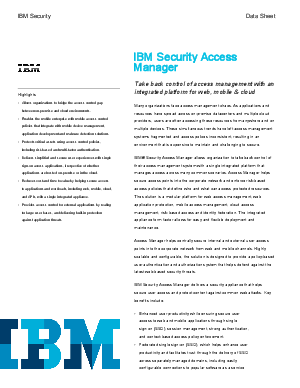 IBM® Security Access Manager allows organization to take back control of their access management system with a single integrated platform that manages access across many common scenarios. Access Manager helps secure access points into the corporate network and enforce risk-based access policies that define who and what can access protected resources.